I saw this adorable Business Card holder on Pinterest from Fellow Demonstrator Sam Donald from the UK. She made a video and joyfully gave us imperial measurements in addition to metric measurements that she uses in her country. So here is my Version with a full picture tutorial. This little business card holder is wonderful for anyone who has to display business cards on their desk or that needs to take them to an event with them. So adorable and versatile. Make one for every mood or season. Make them as a gift for your friends who own their own Direct Sales Business. They will LOVE you and appreciate what you do. 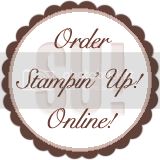 I loved decorating it and personalizing it with my new personalized stamp from Stampin' Up! You can design and view your stamp here. Design it over and over again to get it just right before actually placing your order. Use them for your business, your address, to tell people how you feel about your savior, or to Thank your friends for Celebrating your wedding with you. These are only a fraction of what you can do with them click on the pictures to see what you can do. It's so much fun to design it and see it at the same time! Start with a piece of Cardstock in your choice of color that is 6" x 8 1/4".I used Bermuda Bay here. Score it on the Long Side at: 1 1/2", 2 1/4", 5 1/4", and 6 1/4" then turn 90 degrees and score on the Short Side at 1" and 5". On the long side cut up at the first score marks from each end up to the first score you come to. Remove everything in between those two cuts as shown. Score and fold as shown. In Sams video she said to put it together and then punch your large oval but she used the new style punch and I still have the old style punch. To use it I had to punch before I assembled, ask me how I learned this...yep the hard way. I applied my Designer Series Paper piece to what will be the front of the Box. It is the side that is shorter than the other. You will see this as you fold the box. This DSP layer is 3 3/4" x 2". Add Sticky Strip as shown to both sides and yes use Sticky Strip anytime you are assembling a box because you want it to stay together under repeated use. You will see that after assembling part of the box as shown your sticky strip on the flaps are as shown. We found that when we assembled our box at my last team meeting that if you put the back flap over the front flap you will be happier with the look after you taper the ends. This goes a little against what you might orignally think in your mind to get a "clean look". Don't worry it will be ok. So go ahead and put the back side flap over the top of the front side flap and then trim as shown from front to back. Check her stuff out it's amazing! Say It YOUR Way~Personalized Stamps that you design. Last week Stampin' Up! announced these beautiful new Photopolymer Stamps that we can personalize and make our own. I have had so much fun playing with the possibilities that I just knew you would be as tickled with them as I am. Here are some I made for myself, my family, our business, and just for fun!